...they have never affirm'd any thing, concerning the Cause, till the Trial was past: whereas, to do it before, is a most venomous thing in the making of Sciences; for whoever has fix'd on his Cause, before he experimented; can hardly avoid fitting his Experiment to his Observations, to his own Cause, which he had before imagin'd; rather than the Cause to the Truth of the Experiment itself. Referring to experiments of the Aristotelian mode, whereby a preconceived truth would be illustrated merely to convince people of the validity of the original thought. Thomas Sprat, Abraham Cowley, History of the Royal Society (1667, 1734), 108. Histology is an exotic meal, but can be as repulsive as a dose of medicine for students who are obliged to study it, and little loved by doctors who have finished their study of it all too hastily. Taken compulsorily in large doses it is impossible to digest, but after repeated tastings in small draughts it becomes completely agreeable and even addictive. Whoever possesses a refined sensitivity for artistic manifestations will appreciate that, in the science of histology, there exists an inherent focus of aesthetic emotions. Opening remarks of paper, 'Art and Artifice in the Science of Histology' (1933), reprinted in Histopathology (1993), 22, 515-525. Quoted in Ross, Pawlina and Barnash, Atlas of Descriptive Histology (2009). If you are young, then I say: Learn something about statistics as soon as you can. Don’t dismiss it through ignorance or because it calls for thought. … If you are older and already crowned with the laurels of success, see to it that those under your wing who look to you for advice are encouraged to look into this subject. In this way you will show that your arteries are not yet hardened, and you will be able to reap the benefits without doing overmuch work yourself. Whoever you are, if your work calls for the interpretation of data, you may be able to do without statistics, but you won’t do as well. In Facts from Figures (1951), 463. In science, each of us knows that what he has accomplished will be antiquated in ten, twenty, fifty years. That is the fate to which science is subjected; it is the very meaning of scientific work, to which it is devoted in a quite specific sense, as compared with other spheres of culture for which in general the same holds. Every scientific “fulfilment” raises new “questions”; it asks to be “surpassed” and outdated. Whoever wishes to serve science has to resign himself to this fact. Scientific works certainly can last as “gratifications” because of their artistic quality, or they may remain important as a means of training. Yet they will be surpassed scientifically—let that be repeated—for it is our common fate and, more our common goal. We cannot work without hoping that others will advance further than we have. In principle, this progress goes on ad infinitum. From a Speech (1918) presented at Munich University, published in 1919, and collected in 'Wissenschaft als Beruf', Gessammelte Aufsätze zur Wissenschaftslehre (1922), 524-525. As given in H.H. Gerth and C. Wright-Mills (translators and eds. ), 'Science as a Vocation', Max Weber: Essays in Sociology (1946), 138. A different translation of a shorter excerpt from this quote, beginning “[In] the realm of science, …” is also on the Max Weber Quotes web page on this site. It is requisite that we should here say something of Magick, which is so linked to Astrology, as being her near Kinswoman, that whoever professes Magick without Astrology, does nothing, but is altogether out of the way. In The Vanity of the Arts and Sciences (1530), translation (1676), 109. Man is an imitative creature, and whoever is the foremost leads the herd. As quoted, without citation, in John Walker, A Fork in the Road: Answers to Daily Dilemmas from the Teachings of Jesus Christ (2005), 137. Nothing is really small; whoever is open to the deep penetration of nature knows this. Science and technology, like all original creations of the human spirit, are unpredictable. If we had a reliable way to label our toys good and bad, it would be easy to regulate technology wisely. But we can rarely see far enough ahead to know which road leads to damnation. Whoever concerns himself with big technology, either to push it forward or to stop it, is gambling in human lives. In Disturbing the Universe (1979), 7. Scientific truth is marvellous, but moral truth is divine; and whoever breathes its air and walks by its light has found the lost paradise. 'A Few Thoughts for a Young Man', Monthly Literary Miscellany (1851), Vol. 4 & 5, 155. The future … [is] something which everyone reaches at the rate of sixty minutes an hour, whatever he does, whoever he is. In The Screwtape Letters & Screwtape Proposes a Toast (1961), 130. The sweetest and most inoffensive path of life leads through the avenues of science and learning; and whoever can either remove any obstruction in this way, or open up any new prospect, ought, so far, to be esteemed a benefactor to mankind. There prevails among men of letters, an opinion, that all appearance of science is particularly hateful to Women; and that therefore whoever desires to be well received in female assemblies, 'must qualify himself by a total rejection of all that is serious, rational, or important; must consider argument or criticism as perpetually interdicted; and devote all his attention to trifles, and all his eloquence to compliment. The Rambler, Number 173, 12 Nov 1751. In W. J. Bate and Albrecht B. Strauss (eds. ), The Rambler (1969), Vol. 3, 152-3. Whoever ceases to be a student has never been a student. From chapter 'Jottings from a Note-Book', in Canadian Stories (1918), 169. Whoever despises the high wisdom of mathematics nourishes himself on delusion. As quoted, without citation, in Nicholas J. Rose, Mathematical Maxims and Minims (1988). Whoever does not try, does not learn. Whoever has undergone the intense experience of successful advances made in [science], is moved by profound reverence for the rationality made manifest in existence. Whoever is to acquire a competent knowledge of medicine, ought to be possessed of the following advantages: a natural disposition; instructionl a favorable place for the study; early tuition, love of labor; leisure. In 'Aphorisms for Leo Baeck', Ideas and Opinions (1954), 28. German version, “Wer es untemimmt, auf dem Gebiete der Wahrheit und der Erkenntnis als Autorität, scheitert an dem Gelächter der Götter,” in Lewis Samuel Feuer, Einstein and the Generations of Science (1982), 105. Whoever wins to a great scientific truth will find a poet before him in the quest. 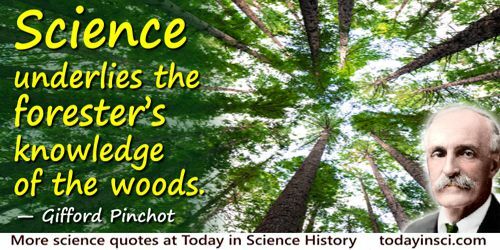 Whoever wishes to acquire a deep acquaintance with Nature must observe that there are analogies which connect whole branches of science in a parallel manner, and enable us to infer of one class of phenomena what we know of another. It has thus happened on several occasions that the discovery of an unsuspected analogy between two branches of knowledge has been the starting point for a rapid course of discovery. Principles of Science: A Treatise on Logic and Scientific Method (1874, 2nd ed., 1913), 631. Whoever would not remain in complete ignorance of the resources which cause him to act; whoever would seize, at a single philosophical glance, the nature of man and animals, and their relations to external objects; whoever would establish, on the intellectual and moral functions, a solid doctrine of mental diseases, of the general and governing influence of the brain in the states of health and disease, should know, that it is indispensable, that the study of the organization of the brain should march side by side with that of its functions. On the Organ of the Moral Qualities and Intellectual Faculties, and the Plurality of the Cerebral Organs (1835), 45-6. Whoever … proves his point and demonstrates the prime truth geometrically should be believed by all the world, for there we are captured. Interview in article by Dean Lamanna, 'It's No Act—He's into UFOs' in UFO Magazine (U.S. Edition, 1994), 9:4.